We all know that the journey is more important than the destination. But that doesn’t mean that you should invest so much in the journey that you have no money when you finally arrive at Disney World, the Grand Canyon, or your grandma’s. Stick to a road trip budget so that you can keep your wallet full for souvenirs when you finally get to the X on your map. Lives are the most precious cargo you have on board. In fact, your life and the lives of your traveling companions are priceless. Therefore, you can save the most by keeping yourself and your family safe on the road. Only gas up at well-maintained, well-lit gas stations at which you see other vehicles stopped. Make pit stops for food and restroom use the same: only stop at well-populated, well-lighted stores, and only stop during the day if you can help it. Keep your valuables out of sight when you leave your car, keep your children by your side at all times, and keep your windows rolled up and the engine off. When you must sleep on the road, research reputable hotels, motels, and b&b’s before you go so that you have a clearly defined destination and an estimate of the time it will take to get there. This will eliminate the temptation to continue pushing for those few extra miles when you’re already exhausted from hours of driving and becoming a danger to yourself and others. Remember to drive safely, obey traffic signs, use your turn signals, stay alert, and stop when you’re tired. Staying safe now can save you thousands later by avoiding an accident or breakdown. 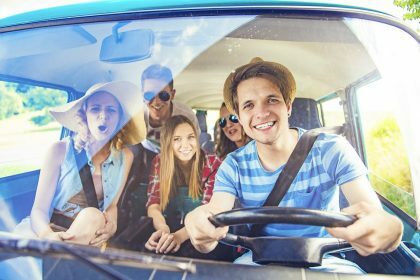 The best way to ensure that you don’t spend more than you can afford while road-tripping is to know the maximum amount you can afford and determine a budget for staying well under that number. You already know what you must purchase on the go: food, accommodations, gas. However, we recommend a traveling “entertainment” budget so that those impulse buys at souvenir gas stations are already accounted for and won’t surprise you by adding up to more than you wanted to spend on the whole trip. Also, don’t forget to expect the unexpected and budget money for breakdowns, medical emergencies, and other crises. The best way to avoid paying more than you budgeted on a road trip is to take all the precautions you can against large bills like car repairs, tow trucks, and unexpected hotel stays. This can be accomplished by making sure your car is in top shape before you set out on your long journey. To avoid breakdowns, get your car tuned up—new oil, tire and brake checks, fluid and lights checks, full gas tank, etc. It’s not a bad idea to let someone peek under the hood, either. The best way to spend money (and quickly gain a few pounds) is to let the healthy food in your fridge go to waste while you make expensive stops at restaurants and gas stations. Even fast food places get expensive, especially if you spring for the combo meals. Instead, why not take along the food you already have? That way you not only save money; you also avoid coming home from a long trip to a fridge full of over-ripe, expired food and unpleasant smells. Also, take advantage of free food on the road. Some rest areas and hotels offer light snacks or continental breakfasts. Load up here and save. Also, don’t forget that grocery stores have even more snack options than convenience stores and gas stations… and at far lower prices. Let’s face it… on long, open stretches of highways in Kansas and other scenic plains states, you’ll hit a dead spot. You won’t receive cell service. Or, you will… and it will cost an arm and a leg in roaming charges. If you already know you’ll be calling grandma and sending her selfies or you and the kids at Mount Rushmore, why not pick up a pre-paid calling card? This makes sure you stay within your phone bill budget and avoids roaming costs, not to mention the cost of calling from hotels. News flash—gas is expensive. However, there are ways to save. The first is driving responsibly. We hate to remind you, but driving at or slightly below the speed limit is not only safe and legal, but it’s also the best way to avoid chugging gas. Also, you may love that breeze in your hair, but be prepared—driving with the windows down will put a dent in your budget. It causes drag on the car which does over time waste gas. Unfortunately, so does blasting the A/C when you’re idling. Be smart about how you use gas. Coast down hills when you can, don’t speed up only to apply your brakes and don’t race other cars to see if you can beat them to the tourist traps. Also, if you take your car in for a tune-up and to air up your tires, this will inevitably save your gas. Perhaps the Waldorf Astoria is your destination. In that case, no doubt you’ve already budgeted for it, and you can sit back and indulge. However, if the point of your trip is to get to a scenic campground, why spend your money along the way at places you only ever intended to use for six hours of sleep before moving on? Unless you plan to really stretch, relax, and use ALL of a hotel or motel’s amenities, we suggest you pre-search for accommodations so that you don’t end up tired in a town that only offers rooms at $1000 a night.